For those in the Seattle marketing community, the odds are pretty good that you have met Max Minzer (follow on Twitter) at a local meetup in the past year. He's almost guaranteed to be the first person to introduce himself to everyone in the room as he is always engaged and interacting with everyone he can in the crowd; certainly one of the friendliest guys you will meet. He is someone who is taking good content to heart, and most importantly is putting in the work of building his own brand by curating community. Considered by many to be an early adopter of the features on Google+, he has quickly found ways to encourage conversation on new media. Max has done a great job of getting me to actually want to spend time on Google+, and introducing me to all of the crazy features of Google+ Hangouts that I had no idea existed. Video is a medium that few online marketing folks have done really well outside of Whiteboard Fridays, and Max has done a great job of delivering conversations that podcasts and article interviews just can't convey. My name is Max Minzer. I reside in the Greater Seattle Area. I have a beautiful wife and a boy who has been our bundle of joy for almost two years now. I strive to be passionate about all aspects of my life, love classical and choral music, and enjoy conducting and reading "physical" books (the old-fashion way). What got you into internet marketing? I started exploring SEO and internet marketing world in the middle of 2010. Over a year prior to that, in the midst of recession, I graduated from the University of Washington with bachelors in physics and mathematics but took a local marketing job I sort of liked but did not enjoy. I knew something was happening online and got curious. 2012 for me was a year of trying to understand and piece all aspects of online marketing together into one big picture. It's tough for me to do something without having organized and structured system in place. So I started to get to know a lot more people in the online marketing world to see the big picture. And that's exactly what I'm excited about for this year - meeting more people in the industry. I love that this industry is continually becoming more social and open, with more meaningful conversations and discussions coming this year. 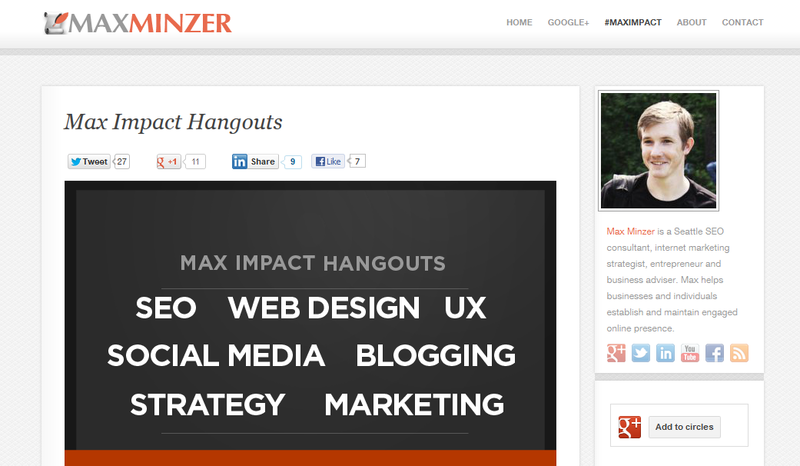 Speaking of meaningful conversations, can you tell us a bit more about Max Impact? Max Impact (#maximpact) is a promotion-free discussion series on topics that are usually (but not always) related to SEO. The live broadcast is a Google+ Hangout on Air with 10 people that's being recorded and shared via YouTube, website and social media. The idea for this series came from seeing the potential of hangouts and being amazed at what people in other industries, not related to SEO or marketing, used them for. The idea behind Max Impact is to have a conference-quality topical information but without conference formality. It's a mix of professional and personal/family styles. What I normally do is interview my special guest, expert on the topic, in the beginning of the broadcast and then have other eight people on the hangout comment, contribute and ask questions. We also monitor and interact live with everyone else watching and sharing using #maximpact hash tag on Google+ and Twitter. I'm excited to meet new people and this series is a perfect platform for that. As for bringing experts/special guests, it's usually networking or simply their own interest. Latter was usually the case (even with big names in the industry) and I'm grateful for that. I'm excited about this year and meeting more people in SEO industry. I believe hardships united us even more this past year, and that makes this an exciting industry. Exciting for me because I don't want to stop learning and want to continue pushing limits, being an early adopter and getting out of my comfort zone. Wishing for everyone (and myself) to have discipline and and passion. Can't always be passionate (that's when discipline comes in) but you also can't be doing SEO for years without any passion. Enjoy what you do and inspire the community around you!